Does your clothing reveal where you are from? The traditional woven textiles worn by the Maya in the highlands of Guatemala define their regional identity. Woven and embroidered most often in cotton each pattern and color combination distinguishes a particular village or community. Women wear a combination of garments. The most prominent is the huipile (a tunic) pictured below. 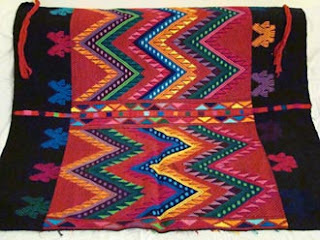 This huipile is from Chichicastenango, which is famous for its market where Maya traders sell their goods twice a week. The tzutes (a rectangular piece of cloth) in the following photograph are from Santa Catarina Palopó a village located on the shores of Lake Atitlán. In Santa Catarina they are worn over the shoulder. The blue and geometric pattern of this village is relatively new, dating from the 1980s. Previously the local attire was predominately red. 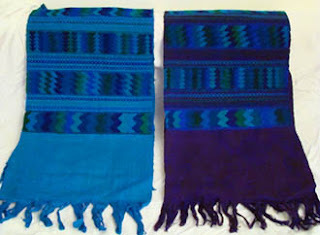 An excellent source for Mayan textiles is Nim Po’t in Antigua. I purchased the huipile from there. I bought the tzutes directly from a woman in Santa Catarina who was selling them during a festival we stumbled upon. I’ll write more about the festival later on. love your blog! I'll link to it, and be back! Thank you so much. Glad you found your way here!